One of the first things we noticed in São Paulo was the graffiti. It's everywhere. 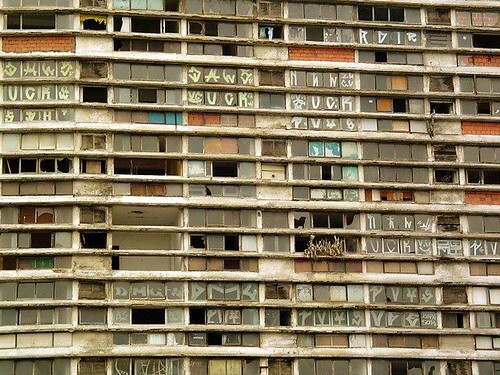 There were no blank walls in São Paulo when we were there. If there wasn't an advert or the insane art of "The Twins" then there was some sort of gang graffiti. We'll talk about "The Twins" later. The gang graffiti in São Paulo looks like the stick-figure hieroglyphics of aliens. It is a very, very unique language and style and it blew all our minds... simply because it was everywhere. Extracting “notes”, from the “historical” diary from a pixador* – was how this book came to existence. 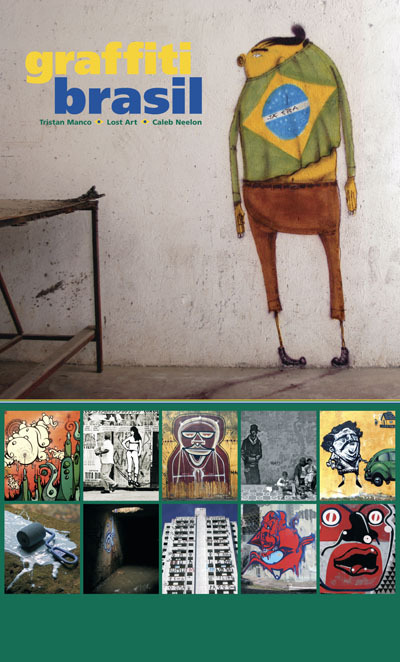 Boleta, who put together this volume, is a member of the first generation of VÍCIO*, one of the oldest and most active graphic-manifestation gangs in São Paulo. The diary dates from 1988 to 1998. These personal notes are a testimonial of how pixo* gradually came to life in São Paulo. We have reproduced pages of this collection of autographs either in their totality or in detail. The photos were the next step. The book’s photographic work reveals how “Pixographics” defines the chaotic mood of the city, yet allowing us to see through the chaos, where beauty lays - multiplying in extension and height – all over the city. Editora do Bispo sees a genuine, contemporary, 21st century form of communication in Pixação*, where a gifted and original graphic creation emerges. This is the first time that their alphabet has been decoded and organized in a book. These symbols, if seen detached from their context, reveal original and sophisticated graphic creations. Ttsss... does not intend to be an encyclopedia of graphic art. It is, however, the editorial introduction to Pixo. Ttsss… is an important compilation that shows a specific stream of young artists - artists who predominantly come from an underprivileged social segment. Their social condition is, nonetheless, the ingredient that makes their symbolograms one of the most original urban phenomenons in Brazil in recent years. *Pixadores. A youngster, generally from an underprivileged social background, frequently living under precarious conditions in the outskirts of the city. A pixador uses pixação a form of protest, but at the same time, as a way of expressing his aesthetic impulse. * Pixação.noun. Of Brazilian origin, refers to writing in own, original codes, signs, symbols, and printing types. The hieroglyphics are printed with spray paint along extensions of walls, façades, and building exteriors in great metropolitan capitals. São Paulo, city where the movement originated, has the richest exhibition of this kind in the world. The origin of the word comes from piche – tar, pitch. Os Gemeos means "the twins" in Portuguese and is pronounced "Ose Zhe'-mee-ose." Got that? "The Twins" are Otavio and Gustavo Pandolfo. They are identical twin brothers born 1974 in São Paulo. Their work often features yellow-skinned characters, but is otherwise diverse and ranges from tags to intricate murals. Subjects range from family portraits to commentary on São Paulo's social and political circumstances, as well as Brazilian folklore. Their graffiti style was influenced by both traditional hip hop style and the Brazilian pichação movement. Their first significant artistic influence outside the city of their birth, and their limited access to American hip hop (Style Wars, Subway Art, Beat Street, etc. ), stemmed from a chance encounter with Barry McGee (who tagged as Twist), who happened to be in Brazil for several months on a study program through the San Francisco Art Institute in 1993. McGee provided them with a lot of photographic examples from the American graffiti scene. Through Barry McGee, The Twins met the part-Brazilian Allen Benedikt, founder of 12 oz. Prophet Magazine who together with Caleb Neelon (a.k.a. Sonik) became the first to interview them after a trip to Brazil in 1997 which became Os Gemeos' introduction to audiences outside of South America. Since then they've become a worldwide phenom. Their art is everywhere from Berlin to Coney Island. Literally. It was pretty crazy because we first discovered their art in Brazil and then realised we'd recognised it from elsewhere in the world. Later that year, a few months after we'd been to Brazil, we were in Berlin and saw their stuff again, and later in Coney Island. It was like we were being followed by their art.